I Postulated to my fellow Btards that it would be indeed possible do download a car assuming one had a 3D printer and didn't mind if the whole thing was made from plastic. and you had a few tons of plastic and you didn't mind putting it together like an ikea car from hell. @ stratagem: Well, you still wouldn't have a working car, so it would be a model car. Things like spark plugs and wiring can't be made from plastic. Also it couldn't handle the heat from friction inside the engine. Even if it's electric, you're not going to make an electric motor from plastic. I wouldn't steal a car, but if I had a magic duplicator ray? I would totally make myself a copy of a car. 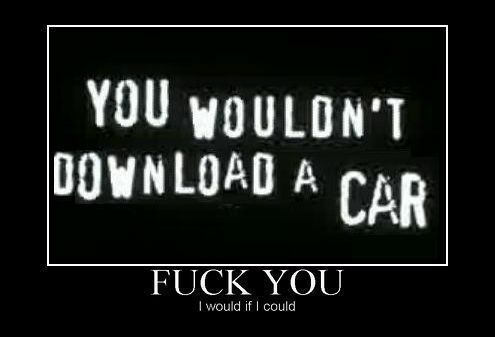 Damn it Marf you just had to go and piss in my cornflakes and call my downloaded car a model. Well that wouldn't stop me from trying to drive that car down a steep hill. You ever see that mythbusters where they create a giant ball out of lego? Then they push it down a hill it rolls shedding lego's all around itself before finally crumbling into a million tiny pieces. Well before that happened to the plastic car for a brief 2-5 second window I would be riding down the street in what looks like a car. THAT I DOWNLOADED FROM THE INTERNET. @ Nathaniel: Exactly. There's a difference between the magic duplicator ray and piracy. @ Stratagem: Sorry. That's just how I am... I like to point out flaws and take things very literal. And yes, I did see that Mythbusters episode.